Inder Loves Folk Art: Dilly Beans. Our pole beans are doing great, and I have been picking handfuls of green beans every day or two. Today I decided to try an American classic I've been wanting to try for a while: Dill-pickled green beans, a.k.a. "Dilly Beans." So I gathered up a few big handfuls of beans and trimmed them. 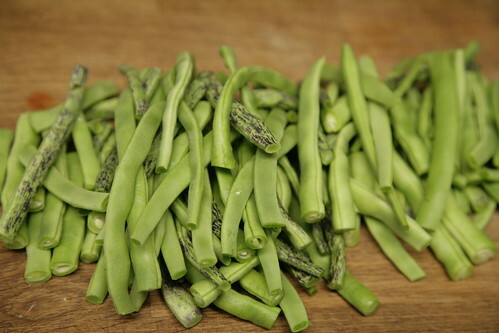 The regular green beans are "Lazy Housewife"; the purple-streaked beans are "Rattlesnake Snap" (unfortunately, most of the beautiful markings fade when you cook them). Then, following this recipe, I made a brine with vinegar, sugar, salt, water, and garlic. 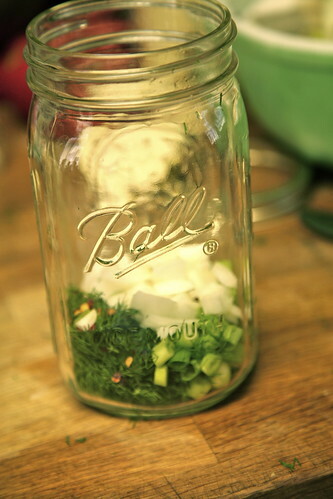 I chopped up dill weed and onions (scallions and regular) and put them in a mason jar, adding some peppercorns and red pepper flakes. 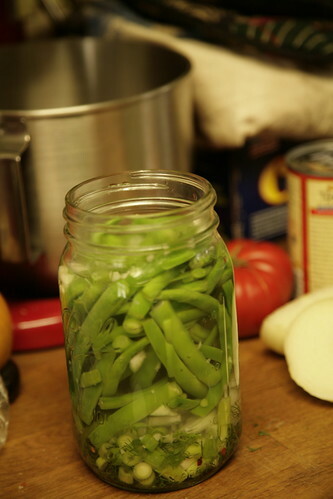 I blanched the beans, packed them in the jar, and poured the brine over the top. Voila! We had some extra beans, so I had my brother Harpal do a second, smaller jar of spicy dilly beans, adding more onion, more garlic, more peppercorns, and a whole chile to give these pickles a bit more "kick." 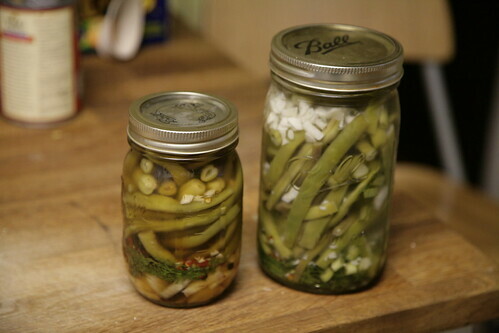 Since I only had enough beans for two jars of pickles, I didn't process them; they're "fridge" dilly beans. Supposedly they will be good for a couple of months in the refrigerator, but with this pregnant woman in the house, I doubt they will last that long! Ohhh, I'm totally going to try this! Thanks so much for the inspiration! Mmm... I had never thought of pickling beans but I can imagine the texture would be tooth-squeakingly awesome. Enjoy! Yep, it's definitely a states thing; it's kind of a regional thing even here. But if you like dill pickled cucumbers, I bet you'd like these too! Tooth-squeaking indeed! Okay, the regular dilly beans are tasty. The spicy dilly beans are EXCELLENT. Definitely can't go wrong with more spice - they are not actually spicy themselves but they have a lot more flavor. YUM.